What about you? Is there something you always travel with that we missed? 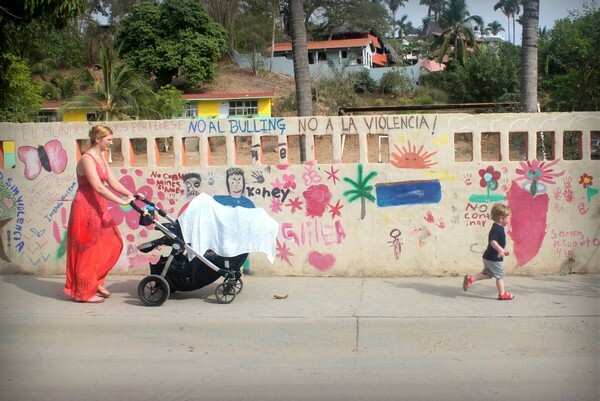 Traveling with a baby is drastically different than traveling solo or as a couple. Shocking news, I know. I vividly remember the first trip we took with our son Braydon (you can read about it here). Aside from the usual pre-trip jitters that most new mothers experience, my biggest fear was being unprepared. There’s a lot to consider – eating, sleeping, clothes, activities, entertainment – to name a few. I put everything I thought we’d need on the bed and wondered how we’d fit it all in our luggage. It became very clear that, unless we wanted to bring 4 large suitcases, we’d need to change our approach and be very selective in what we pack. It was not an easy task. Well, dozens of trips later, we’ve learned that you don’t need as much stuff as you think. Obviously the location and weather will play a big role in what you bring (think beach vs snow), but there are a few important travel items we always bring with us when we travel with our baby. Note: our boys have outgrown some of these items, but both boys used all of these items when we traveled with them as babies. Also, some of the links will take you to Amazon.com. If you make a purchase, we receive a small commission at no additional cost to you. When we’re not using a stroller, we carry our boys in the Onya Baby carrier. Eventually, little legs get tired and they just want to be held. My arms get tired fast when carrying either boy, who are both now over 20 lbs, so putting them in the carrier makes for an easy piggyback or front carry. We also use it for situations where it doesn’t make sense to bring a stroller, like if we’re hiking or walking down a bumpy trail. Or, like in the above picture, we’re at the top of a mountain and we’re nervous about our toddler running around. We wrote a review about our Onya Baby carrier on our other blog – read it here. 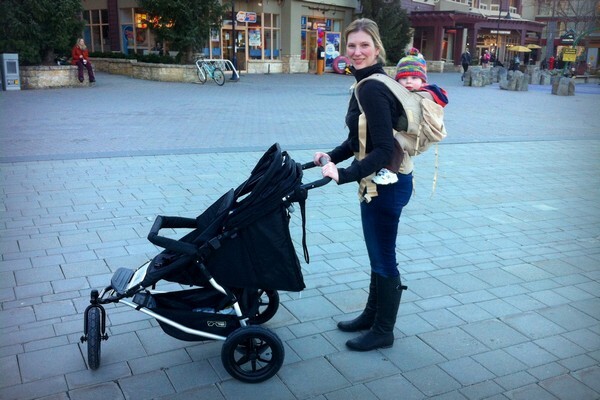 The Mountain Buggy +One Stroller is a new addition to our stroller fleet. We’ve experimented with 4 different strollers over the past 3 years and find this one to be the best for our travel needs. We have two boys, so a double stroller is essential. It’s durable, lightweight and compact. It has sturdy wheels suitable for all types of surfaces, including cobblestone, gravel, dirt and snow. We’ve tested the stroller on all of these surfaces and haven’t had any problems. Unlike our Baby Jogger City Select, which we also like and recommend, the Mountain Buggy +One folds up without needing to take off the second seat. The +One maneuvers easily with one hand, it has a front locking wheel for jogging and it has an easy to use foot break. So far, it’s our favorite double stroller. Our Chicco portable chair is perfect for when we stay at an apartment rental. Most big name hotels and restaurants provide high chairs, but apartment rentals and small cafes rarely have high chairs available. We also bring it with us when we’re visiting friends and family that don’t have a high chair available, so we use it outside of travel situations, too. This brand isn’t the most compact option, but I really like how sturdy it is. I never worry about it falling off the table and it folds flat, making it easy to transport. The material is easy to clean, which is important if you have a messy eater like Connor. We found it most useful between the ages of 4 months to 16 months. Note: you can also convert the Onya Baby Carrier into baby chair strap if you’re in a jam – here’s a photo that demonstrates what I’m talking about. If you look at the above image again, the one with Connor sitting in his portable chair, you’ll notice a blue rubber placemat on the table in front of him. This is another favorite travel item because it’s lightweight, easy to clean and conveniently rolls into a small tube. Once baby is finished eating, roll up the placement and you’re ready to go. Both of our boys thought is was funny to throw their food plates on the floor, which obviously makes a huge mess – not to mention the loss of food, which is important when you’re not at home and don’t have a fridge full of food available. This rubber placemat makes life much easier. We put food directly on the placemat because we know the surface is clean and sanitary. The placemat has suction cups on the bottom so it stays firmly placed on the table surface. We bring it with us whenever we eat at a restaurant, whether we’re traveling or at home. The best invention EVER! Whoever invented these fantastic sleep sacks – I love you. Both boys have slept in sleep sacks since birth and they love them. They are a safer option then traditional blankets and they provide a clean, familiar sleeping experience when traveling. And, most importantly, they make it difficult for little climbers to climb out of the crib or bassinet. We have several sleep sacks with varying thickness and material, which allows us to regulate their sleeping temperatures. Connor is wearing a lighter sleep sack in the photo above. This photo was captured while on a sleeper train to the Canadian Rockies. Portable cribs are an important item in every baby travel arsenal. Most hotels have standard pack-n-play style cribs available, but there’s something about rental cribs that makes me cringe a little – especially with a newborn. Lately we’ve been staying at apartment rentals because it allows our boys to have separate sleeping rooms (we all have different sleeping schedules). Most apartment rentals do NOT provide baby cribs, so you’re forced to either rent a crib from a third-party service or bring your own with you. I feel much more comfortable having our baby sleep in a bed that I’m familiar with, so I prefer to bring my own. Although they are not cheap, the Phil and Ted’s pictured above is around $200 CAD, it is reassuring to know that my babies are sleeping in a safe, clean place. If you plan to travel a lot with your baby, consider this a wise investment that will pay for itself after a few trips. Keep in mind, you can always sell the portable travel crib once your baby no longer needs it. The reason I choose this travel crib was price – it’s less than the Baby Bjorn and the reviews are similar. It packs up fairly small and comes with a carry bag. I also like that the sides are made with a durable, breathable mesh, so I don’t worry about suffocation. 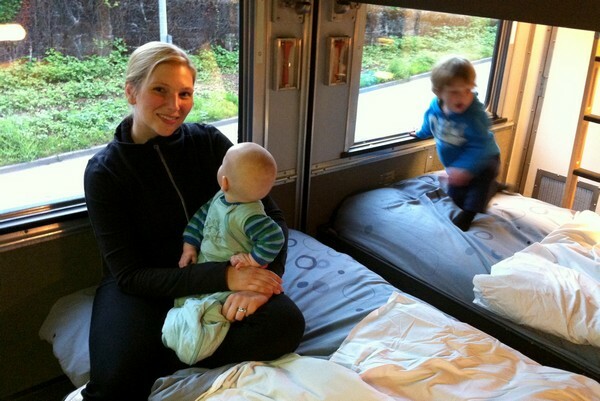 When our boys were under the age of 6 months old we used the Summer Infant by your side Sleeper when traveling. Eventually, the bassinet was replaced by the portable travel crib mentioned above. This travel bassinet has a metal frame that folds to fit easily in your suitcase. It’s relatively small and fairly lightweight, so it travels well. I like the option to put it on the bed beside me when I sleep. I also like that it has a breathable mesh wall so I don’t worry about him suffocating. We’ve tried several baby video monitors only to return them because they didn’t work well. Okay, that’s putting it mildly – they all sucked! Then I found the Summer Infant brand and have become a fan ever since. We purchased the Babies R Us model pictured above because it’s slightly cheaper than the other models. Even in a pitch black room, I can see him perfectly on the video monitor. It’s small and easy to set-up, so we bring it whenever we stay at a vacation rental or if there’s a chance we’ll need to put our boys down for nap. It comes in handy when you’re in a loud environment or far away from the baby room. It gives us peace of mind to know that if he’s crying we can hear him – and see him. We’re big fans of the Clek Weelee and recommend it to all traveling families. It’s a universal travel bag designed to protect your car seat from damage while in transit. We use it for our Clek Foonf Car Seat because it’s a very heavy car seat, so the wheels become essential. That said, you can use it for virtually any car seat. The Clek Weelee has two sturdy wheels and a fold-up handle for easy transportation. An added bonus is that there’s typically plenty of space left over, so we fill it up with other bulky travel items like diapers, blankets and outerwear. Car seats are not typically charged a baggage fee, so this is a sneaky way to lighten your checked baggage weight and save a little money on baggage fees. Related – Do you need to bring your travel car seat? The Rise Gear travel bag is a portable shelving luggage that allows easy access and organization. Basically, the bag has collapsible shelving that separates clothing. This allows you to organize items and separate clean clothes from dirty clothes, eliminating the need to shuffle or unpack your clothes. It’s nice to be able to separate our boys clothes so we don’t mix them up. I’ve managed to comfortably fit enough clothes for both boys plus myself (excluding bulky items like diapers and wipes). It’s perfect for short trips and/or weekend getaways, but I don’t think I’d use this bag for trips longer than 5-7 days. 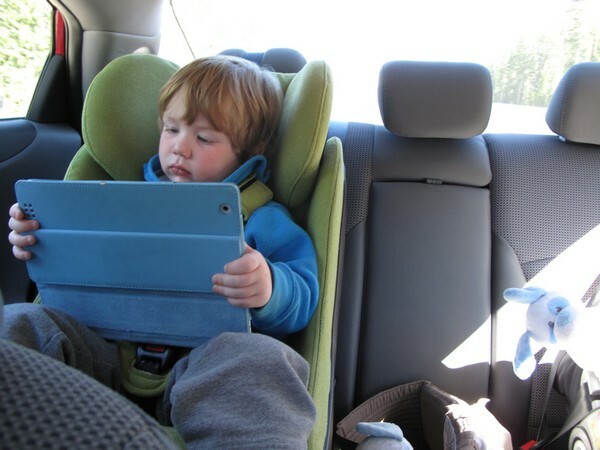 Tablets have become an essential travel item for our family. Seriously, I don’t know how we survived before tablets and smartphones. I can’t decide if that’s good or bad. We bring two tablets when we travel – an iPad and a Microsoft Surface. Having two tablets means one is typically available for adult usage. It also prevents meltdowns if one tablet should run out of battery power or if they both want their own. We use our Microsoft Surface for cartoons and movies because it has a USB port, which makes it super easy to transfer files or use a memory stick that’s loaded with cartoons and movies. We use our iPad for games, music and videos. There’s a lot of fun baby apps to download – our boys love Giggle Bellies, Thomas the Train and nursery rhyme stories. Both tablets are loaded with white noise (sounds of rain, waves crashing on the beach, etc). At night or during naps, we crank up the volume and put the tablet beside his crib. The loud white noise is soothing and drowns out other sounds that could potentially disturb him while he sleeps. It works especially well during daytime naps, when we are awake and moving about the hotel room or apartment rental. While you may be able to tune out the sounds and songs coming from your child’s tablet, it’s likely going to annoy other passengers on the airplane or train. One solution is to turn the volume down very low – but this rarely works for long periods of time. Another option is to bring toddler friendly headphones. Headphones make it easy for your child to listen to songs, games and shows without disturbing others. Not only are they great while on an airplane or train, they work very well when sharing a hotel room with your baby or at a public place like a restaurant or cafe. Braydon loves his Spiderman headphones. This model is about $20 and has a built-in volume control to protect his little ears in case he accidentally cranks up the volume. They are padded and stay on head comfortably. Our boys like to be a part of the travel experience. This often means having their own carry-on luggage. We allow them to pack a few toys, books and snacks for the plane or car ride. They feel like big boys and enjoy choosing the items that will join the adventure. We’ve recently welcomed two Melissa and Doug’s Trunki’s into the family. They are made of hard plastic so they’re durable and sturdy. They’re relatively lightweight with integrated wheels and stabilizers to prevent toppling over. They also act as fun toys that the kids can ride while at the airport or train station. A serious game changer when waiting for the plane to arrive – but be forewarned, you’ll be answering a lot of questions by other parents. Baby teething is frustratingly unpredictable. It seems like every time we travel, a tooth decides to make an unwanted appearance. Sleeping in an unfamiliar bed is tough enough for a little one, now add the pain of teething to the sleeping experience. It’s not fun for anyone. Baby Tylenol and/or Advil to the rescue! Even if your baby is not teething, bring two bottles of baby Tylenol and put one in your day bag. You may not need it, but if you do, you’ll be thankful you have it. We typically bring two bottles of Tylenol (it lasts up to 4 hours) for the daytime and one bottle of Advil for the evenings (it lasts up to 8 hours). While staying at an all inclusive resort in Mexico, the floor in our hotel room was slippery tile. Our first born is prone to accidents on a good day, so it was no surprise that he slipped and bonked his head on the floor multiple times. Tylenol came in very handy. Keep in mind, your destination or resort may not have children’s Tylenol or Advil available, so come prepared. This one seems to get a lot of controversy. Some of you may be questioning this baby travel item and feel that it’s unnecessary. That may be true for your baby, but our boys LOVE bath time and we try to stick with our bedtime routine when we travel. For us, this involves a bath every night before reading books. Without a quality bath, we risk having a cranky baby that can’t get to sleep, which is not fun, especially if you’re sharing a hotel room. Holding a slippery baby in the bath is not an easy task, so we use a baby bath tub chair (we use this bath tub chair at home too). We use the one pictured above but I can’t find it online anymore. This one is quite similar. On the surface, the bath tub chair appears to be an awkward travel item; however, it’s actually very easy to travel with. It’s lightweight and fits easily in our suitcase. Because it’s made with hard plastic, it provides protection for liquids and other breakable items that are in our luggage. We use it as an anchor and pack around it. Most importantly, our boys love this bath chair because it gives them the freedom to sit calmly in the water without us having to hold them upright. This, in turn, results in longer, more enjoyable baths. If you have a baby that loves bath time, you’ll want a baby bath chair with you when travel. Lots of sunblock! Bring at least two bottles and keep one in your day bag. Themed band aids for bonks and bruises. They are a life saver! Travel-sized food containers, preferably in a bowl shape with locking lid. Good for transporting food and heating up hot cereal while on-the-go. Just ask for hot water, mix with cereal in the portable bowl, then close the lid when finished and clean the container when you get back to your hotel room. Plastic baby bottles. We’ve tried a dozen different brands but our boys will only use these Born Free bottles. Insulated freezable food/bottle bag. I can’t find the one we use, but this one is quite similar. Look for one with freezable gel permanently built into the liner so you don’t need to bring additional ice or gel packs. Liquid dish soap in a small travel bottle. You will need dish soap to wash your bottles, food containers and utensils back at the hotel room. Lots of baby wipes. I know you’re already packing baby wipes – this is a friendly reminder to bring more than what you think you’ll need! Share your tips and recommendations in the comments section below. Let’s share our best practices so we can all have better family travel experiences. Our readers thank you! What a great list. But wow, what a lot of stuff! I have a 4-month old and I’m beginning to realise why everyone tells me it’s so much easier to travel with a small baby as they don’t need quite so much. This is a list I wished I’d had when my kids were younger. I am going to be sharing this with everyone I know that has little kids. What a great post! WOW! #10 was awesome! The bag that has shelves! I love it! One thing that you forgot was a MagnaDoodle. We took 2 road trips this summer, and our kids loved playing with their MagnaDoodles one some of the longer stretches of the road! So true! We have those too and they are awesome on the plane and in the car. Thanks for following along 🙂 We hope to be coming your way sometime soon. I saw your blog through Joao Leitao’s amazing list of top travel blogs http://www.joaoleitao.com/resources/top-travel-blog some days ago. Love your blog. I follow your blog articles regularly. This was awesome info. Thanks John! So happy to you like our blog. Very helpful post and interesting blog. Informative article! I will share this with my best friend who has kids that plan to travel to Europe this July. Awesome you have hit the nail, i was looking exactly all these information before booking tour in Thailand. Am traveling with 2 kids. Oh thank you so much. I travel whenever possible and I was so worried about resuming my travels with a baby on board. Just a mental list of things to take makes me nervous. Your blog is just the thing I needed. It is a great list; very helpful. I love the bag with the shelves. Yikes! That list is a little overwhelming but I can see where it’s all necessary. Love the Rise Gear Travel Bag, I think that would come in handy for anyone! I would use it for myself! Great Post, I can’t imagine trying to travel the world with small children. I applaud you! Thanks for sharing these great tips. I am going to sharing this with my friends who have little kids. These tips will really help them while traveling with there babies. Great article. It was fun reading it. Thank you for sharing it. Really very helpful when travelling with baby.. and nice pics. The first thing I take with is Turkish peshtemal towels which is light and can be used as changing pad, blanket, a towel, and even a sling. This thing will help all the parents who want to travel with their kids. Thank you for sharing such an awesome information and keep doing great work. Nice article. We are expecting our 2nd son in a month and already planning a fall Europe vacation. I’m curious where did you get the double stroller? We have two. We have a mountain buggy + one (better for Europe and cobblestone streets) and a City Select. Both are bigger double stollers, but we prefer to travel with a bigger stroller so that it can also hold our stuff while we are traveling. You can buy them online, or at a local baby store. Thank you. I was referring to Mountain Buggy Plus One. I checked amazon.ca and they are not available. Did you get yours online or from a local baby store? We got ours directly from the manufacturer. We did not order this one on Amazon. Thank you. I’l look into this. Btw when you guys travel, are you bringing all the accessories for the stroller? (I.e. Second seat and carrycot). If so how easy is to travel with all of them. Since our second son will be 6 months when you travel I’m wondering if I’ll need the carrycot for his naps or does the second seat reclines? We use the baby bjorn travel crib and recommend it. So quick and easy to set up and pack up, we couldnt travel without it. We converted ours into a backpack for easy transport. A very detailed list for parents traveling with their kids. Thank you for sharing, especially the Tylenol parts, very helpful. We are traveling to Germany with a 22 month old coming up. I’m having a hard time figuring out what to do about high chairs, sleep arrangements, etc. Any tips/suggestions/blog posts for that age group? The students learn different skills like rhythm, flexibility, and coordination at Montessori schools in Columbia. The baby carrier is an absolute must. Believe me, you won’t realize how handy it is until you actually use it! And the best part is you can even use it when you’re at home, so you can do chores and other things while holding your baby, or use it at the park or for trips to the zoo or whatever. It’s just so handy for so many things. Hello! I’m really finding your blog to be a practical resource in planning my first trip that involves air travel with an infant and am hoping you can field a pressing question: our first family trip coincides with the purchase of our first convertible car seat! I’ve been researching the Foonf and Fllo (definitely going to follow your advice about the Clek travel carrier, as my baby will be travelling in the Ergo carrier while we fly! )… can you share a bit about your experience with the Foonf? Is the rigid latch extra helpful (if your kids are forward facing at this point) and do you feel that it is worth the extra weight to have it? These are great travel must-haves when you’re with your baby. Traveling is one of the most beautiful and wonderful hobbies for millions of people across the world. The ability to move around form the one place to another place is the main virtue one can ever have. It also a source of pleasure. pressing question: our first family trip coincides with the purchase of our first convertible car seat! I’ve been researching the Foonf and Fllo (definitely going to follow your advice about the Clek travel carrier, as my baby will be travelling in the Ergo carrier while we fly! )… can you share a bit about your experience with the Foonf? Is the rigid latch extra helpful (if your kids are forward facing at this point) and do you feel that it is worth the extra weight to have it?